Rebuilding Britain – is it fact or fiction? A brief overview of the book that is challenging the widely held view that it is impossible to achieve a better future, suggesting that there is a real choice in how society develops. Rebuilding Britain is the brainchild of Hugh Ellis (head of policy at TCPA) and Kate Henderson (CEO of TCPA and visiting professor at the Bartlett School of Planning, university college London.) The book aims to dissect some of the most common issues that face modern Britain in its social journey into an unsure future. Historically, scholars, governing bodies, planners and developers alike have discussed the search for Utopia. With this quest seemingly abandoned at present, has the ethos of utilising the good qualities we already have at our disposal, summarised in WW2 as “make do and mend” devolved into simply “make do…?” Have we become too big and is it too late to implement real, positive changes or with the assistance of modern technologies and higher education is the possibility of a Utopian society finally within our sights? You may ask yourself why two successful planners would decide to write about the decline of community values experienced by our nation as of late – after all preserving communal identity is arguably one of the primary responsibilities of planners and developers alike. Indeed, how can you lament the days when children played together outside on the village green within a safe environment when the village green has long since been levelled, concreted and turned into an overspill car park in the name of progress? Hugh Ellis and Kate Henderson believe strongly in looking retrospectively at where we have come from and how we did it, from the earliest days of Britain becoming mobile and accessible for all, with innovative infrastructures successfully creating new communities from the seemingly irreparable damage caused by two world wars, economic disasters and industrial scars; the darker side of Britain’s long and illustrious past. This book is refreshingly honest and open, the appeal lying in its ability to look at the successes of the past and learn from our mistakes. After becoming virtually bankrupted by war, the priorities of British planners shifted towards being more economically driven. It was in this period that quality and standards became lower and by the 1960s the search for Utopia was no longer relevant within the construction industry. Small, close-knit communities were set aside as we reached for the skies with an eye on the figures, in cheaply built high-rise buildings and expanding concrete jungles. Hugh and Kate suggest that during this shift from a socially driven style of town planning to a more austere, money-focused practice that perhaps the most important element was left out – Humanity. The first section of the book focusses on the rhetoric; how are we going to live? Why should we care about the future? The section boasts the slightly antagonistic but punchy title “we are not a poor nation but we are badly organised.” This title sets the tone and immediately promotes intrigue in the reader. The book continues in this fashion. The second part of the book is entitled “the lie of the land” and covers how basic demographic and geographic aspects of Britain can affect planning projects and distract us from the pursuit of Utopia. Many challenges arise when looking at developing a town within Britain, such as varying regional economic performance, unemployment figures and cuts to public investment varying from North to South – the North South divide. Also – although less commonly associated with Britain – the effect of climate and extreme weather needs to be taken into account in regards to construction. In some of the key British coastal towns such as Portsmouth, Hull and multiple towns across Devon, poor planning has been made particularly evident by this year’s flooding. Another big topic which has had a drastic impact on town planning is the shortage of adequate homing for people, personified by British media as the housing crisis. This has played a big part in driving down the quality of housing (both social and private) out of a necessity for quick builds. Often poorly designed and lacking in all basic comforts deemed unnecessary by many modern designers, these houses lack human touches which are incredibly important to the wellbeing of a society, such as gardens, windows overlooking green spaces and adequate parking facilities. This new culture of cutting corners and overlooking all but the bare essentials in order to provide for society has an almost counterproductive impact, serving as only a quick fix for now but presenting more problems further down the line. The book is not all doom and gloom about how we have lost our way; it merely aims to bring some important and slightly uncomfortable truths to light in order to allow us to focus on achieving our full potential as a Nation. Britain has many outstanding assets, despite recent recessions and monetary inflation it still remains an economic world power and is also one of the most culturally rich and diverse places on Earth. Outlining these positive accolades the book then develops in the latter stages, describing how we can harness our potential and change the way we plan to ensure a brighter future. By prioritising a difficult but not impossible plan of action, Kate and Hugh suggest that we must strive for a fair and efficient society. With optimism the authors speak of how it is crucial that planners regain the trust of the people of Britain, namely by taking it back to the visionary and artistic discipline it once was. By involving the community in the development of their homes and towns and listening to what they want rather than what is deemed necessary will help create a proactive, two-way communicational approach to essentially making Britain better. What we don’t need is housing estate upon housing estate with no regard for leisure and fun. Planners have for too long been building units, serving merely to tick boxes. These feel more like a person is being ‘stored’ in a container rather than living in a home where they can thrive and interact with their surroundings. The planning authorities have become detached from the idea that what they are providing is not a ‘product,’ it is a space where an actual living person will exist. It is time to bridge this gap and remember what we are planning for, or perhaps who we are planning for. It is widely documented that poor housing choices can have a direct impact on children being able to access to rewarding work that can define a person’s wellbeing. We need to be able to inspire the younger generation to want to be part of the solution rather than stored in a prefab house where their development can be severely thwarted. local employment prospects negate or lower the need to commute, taking revenue away from the community. You may be thinking that all of this sounds like blue sky thinking and a frighteningly expensive investment but by managing funding and budgets wisely, deterring from multiple cheaper buildings and raising the quality of existing builds this shouldn’t cost more than what we currently spend on housing and town planning. It is merely a wiser spend! Good practice shouldn’t cost the Earth and this book makes you think that if we don’t change our ways we just might ultimately pay that price. Readers of Rebuilding Britain could be forgiven for at times confusing this book with The Communist Manifesto, but Marxist similarities aside it is written from a very informed angle with statistics and examples to back up even the most radical of principles. 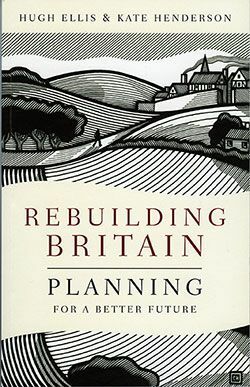 It seems that Rebuilding Britain serves less as a political agenda or mere agitprop and more as a self-help book for a powerful nation that is perhaps currently floundering somewhat. Is it time to look to the future? Definitely. Is Rebuilding Britain the answer? Possibly. Joe is leading journalist for Building Specifier – focusing primarily on the latest news within the construction sector. With a keen interest in eco-friendly practices within the industry, he seeks out stories of innovation, responsible building methods and renewable energy sources; adding a level of human interest into his articles. Right to buy – Right to stay?